A lovely bare-bones approach to managing mass transit. Designing an efficient subway system isn’t all that tough. You just have to connect all the stops and make sure people can get where they need to go relatively easily. Simple. And at first in Mini Metro, a game that challenges you to serve increasingly irate passengers, it is that simple, because you only have a few stops to connect, and plenty of trains to shuttle people around. And then things get a little more... demanding. 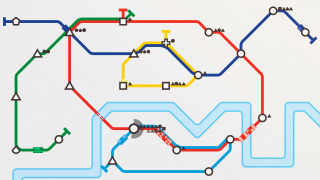 Building an actual subway system is a complex arrangement of timetables and geography, but Mini Metro simplifies everything into colorful lines and geometric shapes. Stops are represented by circles, squares, triangles, and suchlike, with passengers at each stop indicating where they want to go with the same shape. No budgets, no names, no information you don’t need getting in the way of your planning. You’re afforded a certain number of train lines, a certain number of cars, and other necessary constructions like tunnels and bridges. New stops pop up periodically as you work, forcing you to rethink or retool your current design. Setting up your lines is as easy as dragging your finger from one stop to the next, but keeping your passengers happy is a whole other thing. Folks naturally want to get to their destination as fast as possible; fortunately, they’re not overly specific. Any stop of the appropriate shape will do, but the rub is that some shapes are more plentiful than others. You might have 10 circles on your line, but only one square, which means you have to make sure you have plenty of different ways to get to it, so that square passengers aren’t left tapping their feet in vain on the platform. Mini Metro is a simple concept executed perfectly, with bright colors, pleasing shapes, and charmingly chirpy sounds handily offsetting the franticness with which you’ll attempt to get people from place to place and oh my GOD what am I supposed to with that hexagon that just appeared out in the middle of nowhere? Take a cab, people!